Ideal for making long earrings and other beaded accessories Length: Approx 34mmWire thickness: Approx 25gauge Quantity: 50 ball pins in a pack Color: Golden finish* (Note that these are not made of gold) * True colors may vary from what you see on your screen.. 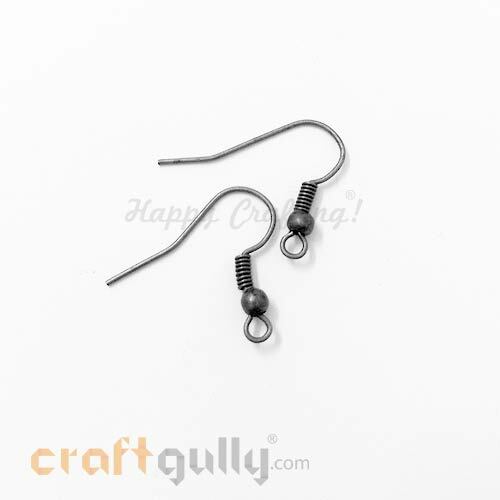 Ideal for making long earrings and other beaded accessories Length: Approx 34mmWire thickness: 25gauge Quantity: 50 ball pins in a pack Color: Silver finish* (Note that these are not made of silver) * True colors may vary from what you see on your screen.. 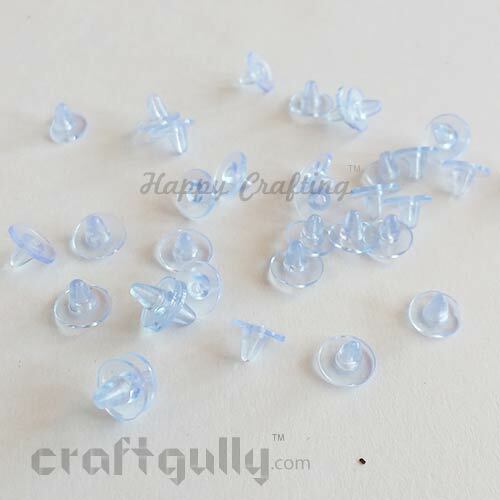 Ideal for making long earrings and other beaded accessories, you can cut these as per your requirement. Length: Approx 60mmWire thickness: Approx 27gauge Quantity: 25 ball pins in a pack Color: Silver finish* (Note that these are not made of silver) * True colors may vary from what you see on your screen.. Whether you are making earrings, or you have lost the backs to your favorite pair, these barrel/ bullet earring backs with clear pads will come in handy. Quantity: 24 in a pack Size: Approx. 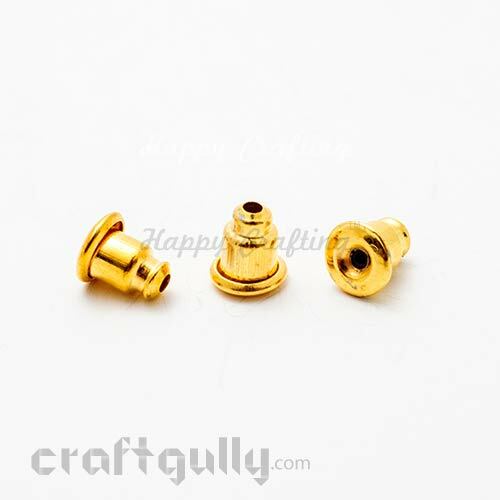 5mm Color: Golden True colors may vary slightly from what you see on your screen..
Soft and ultra light, these small little stoppers will ensure that your earring stay put without adding to the weight and will not be seen at the back. They are also great for little girls. Disc Width: Approx 7mmTotal height: Approx 5mm Quantity: 100 in a pack Color: Clear True color/s may vary slightly from what you see on your screen.. Whether you are making earrings, or you have lost the backs to your favorite pair, these barrel/ bullet earring backs with clear pads will come in handy. Size: Approx 11mm wide, and 6mm high Quantity: 20 in a pack Color: Golden with clear pad True colors may vary slightly from what you see on your screen.. Whether you are making earrings, or you have lost the backs to your favorite pair, these barrel/ bullet earring backs with clear pads will come in handy. Size: Approx 11mm wide, and 5mm high Quantity: 20 in a pack Color: Silver with clear pad True colors may vary slightly from what you see on your screen..
Beautiful clasp earring with a lever back. Size: Approx 15mm x 10mm (L x W) Quantity: 4 in a pack (2 pairs) with jumprings Color: Silver Finish (note these are not made of silver) Metal: Metal True color/s may vary slight from what you see on your screen.. Pack of 50 pairs (100 pieces) of metal earring hooks in golden color. Note: These are not made of gold Colors may vary slightly from what you see on your screen.. Pack of 50 pairs (100 pieces) of metal earring hooks in silver color. Note: These are not made of silver Colors may vary slightly from what you see on your screen.. Pack of 6 pairs of metal earring hooks in silver color. Note: These are not made of silver True color/s may vary slightly from what you see on your screenThis pack does not contain any jumprings..
A pair of beautiful hook earrings with rhinestone and rings Size: 18mm x 12mm Size of rhinestone: 4mm Size of jumprings: 3mm Quantity: 1 pair of each in a pack (1 pair of earring hooks and 1 pair of jump rings) Color: Golden finish (these are not made of gold) Metal: Plated brass Colors may vary slightly from what you see on your screen..
A pair of beautiful hook earrings with rhinestone and rings Size: Approx 20mm x 12mm Size of rhinestone: 4mm Size of jumprings: 4mm Quantity: 1 pair of each in a pack (1 pair of earring hooks and 1 pair of jump rings) Color: Silver finish (these are not made of silver) Metal: Plated brass Colors may vary slightly from what you see on your screen.. 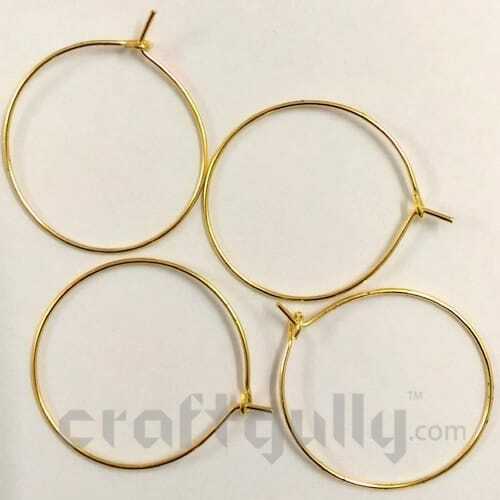 Pack of 3 pairs of metal hoops in golden finish. Size: Approx 24mm True colors may vary slightly from what you see on your screen.. Pack of 3 pairs of metal hoops in silver oxidised finish. Size: Approx 24mm Note: Colors may vary slightly from what you see on your screen.. 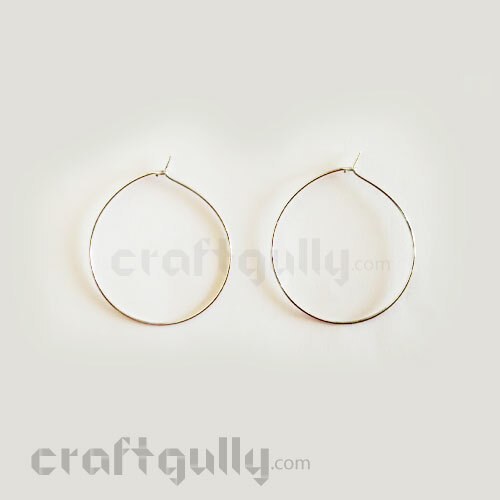 Pack of 2 pairs of metal hoops in silver oxidised finish. Size: Approx 35mmColor: Golden Finish (these are not made of gold) Note: Colors may vary slightly from what you see on your screen..